Critical dimensions (CDs) of microscopic patterned wafer features are measured by scanning electron microscope during the semiconductor manufacturing process. In conventional CD-SEM specimen preparation, individual dies are cut from a wafer and then each specimen is prepared by a traditional ion milling system, one specimen at a time. 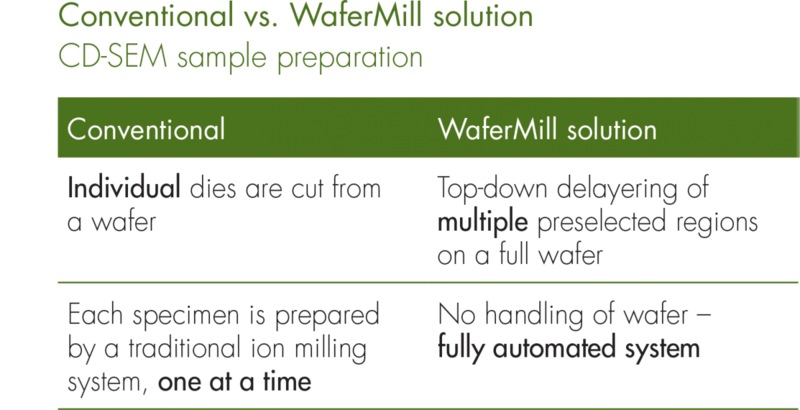 With the WaferMill solution, you can delayer multiple pre-selected regions on a full wafer from the top down. 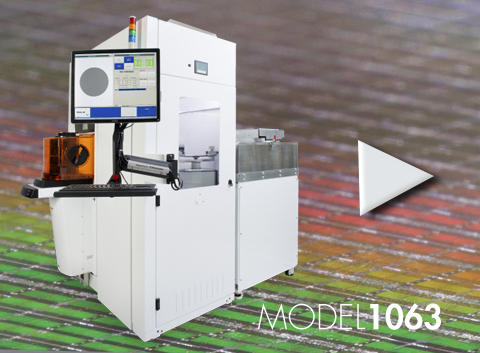 The entire process is fully automated; there is no need to manually touch a wafer. The WaferMill solution supports metrology, including CD-SEM sample preparation. One FOUP loading station that holds 25 wafers that can be up to 300 mm in diameter. Four-axis wafer handling robot with a passive end effector to transfer the wafer from the FOUP into the pre-pump chamber. Pre-aligner to initially orient the wafer so that pre-established sites can be ion milled. Pre-pump chamber. The pre-pump chamber interfaces with the EFEM through a 300 mm gate valve. A dedicated turbomolecular drag pump evacuates the pre-pump chamber. UV light. The pre-pump chamber includes a dual wave length (253.7 nm and 184.9 nm) ultraviolet (UV) light that cleans the wafer post ion milling before reloading the wafer into the FOUP. Load lock. The wafer moves from the pre-pump chamber to the process chamber through a second 300 mm gate valve. Process chamber. The wafer is captured by an electrostatic chuck, which ensures an even milling plane by eliminating any bow in the wafer. The stage translates into the milling position (x and θ), which allows access to any position on the wafer. The turret contains three argon ion sources that provide uniform milling, as well as a rocking assembly (120 ±10°). Rotating the turret normalizes milling and avoids curtaining. A dedicated turbomolecular drag pump maintains the desired chamber pressure. With the WaferMill solution for CD-SEM specimen preparation, you can delayer multiple pre-selected regions on a full wafer from the top down. The entire process is automated; there is no need to manually touch a wafer. The front opening unified pod (FOUP) is part of the equipment front-end module (EFEM). The FOUP loading station holds up to 25 wafers. The four-axis wafer handling robot removes the selected wafer from the FOUP and then places it on the pre-aligner. After the pre-aligner correctly orients the wafer, the robotic arm removes it from the pre-aligner and then inserts it into the pre-pump chamber in preparation for ion milling. The WaferMill solution's three argon ion sources ensure uniform milling of the selected area(s) on the wafer.